Someone, or something, generated a for-sale book out of open source articles on the Call of Cthulhu CCG and LCG, of all things. Fascinating, especially considering the “seller” is asking $62.11 for a 100 page paperback. Maybe it’s a sideline for a higher education textbook publisher? Hey-yo! George R. R. Martin implies he’s finished A Dance with Dragons. To put that in a personal context for myself, the first novel, A Game of Thrones, published just before I began my freshman year of high school. The most recent volume, A Feast for Crows, came out in 2005. That was the first year I attended Carnage. The book hit the week before the convention. In fact, I saw Feast for Crows at Carnage. We were playing a GURPS Banestorm adventure when Chuck strolled up and handed one of the players a copy. She squeed a bit. I think that was the first time I encountered the series at all. I’m going to let you in on a source for cheap role-playing books: Paperbackswap.com. Like the name implies, it’s a website that abstracts swapping books. You list the books you no longer want and create a list of those you do. As people request books from you, which you mail off to them, you get credits, which can be spent to get the books on your wish list or you find via browsing. Think of it as turning one book into another for the cost of packing and postage. In addition to my fiction and non-fiction reading, Paperbackswap has turned out to be a resource for picking up role-playing books on the cheap. Plus, a couple titles I threw on my list for fun — GURPS Technomancer and GURPS Voodoo — both appeared. Battle-worn, well-loved copies, but still there. Most of what I’ve picked up are GURPS supplements, but I also acquired Uresia: Grave of Heaven. There are, however, two provisos. This is not a speedy process. Most of the role-playing books I’ve acquired through Paperbackswap sat on my wish list for a year or more before someone happened to list the book, or it became my turn to receive a copy. You have to be prepared to play the long game. It doesn’t hurt to have GURPS Places of Mystery in my queue, no matter how long it takes to show up, if ever. Two, these books are typically not in collection-grade condition. In fact, if a role-playing book has gotten to the point that the owner is willing to list it on Paperbackswap, it’s probably seen a lot of action. Which can work out great, if it’s a title that normally demands high prices. You get the content with none of the worries about maintaining the book’s condition or feeling bad about how much you paid. Paperbackswap isn’t a guarantee of getting cheap role-playing books, but it never hurts to set up that wish list. You even get two credits to start off when you sign up. A copy clearly used, but not necessarily well loved. Monday evening, I found myself browsing through Crow Bookshop on Church St. As part of my used book browsing routine, I always hit the science fiction and fantasy section, as well as the game shelf. I don’t often find anything, but it’s a habit that’s paid off in the past. 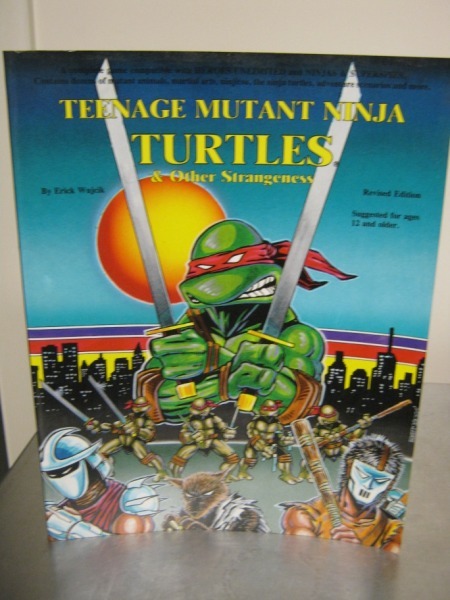 This time, I found a very nice copy of Teenage Mutant Ninja Turtles & Other Strangeness, the game lovingly spoken of by so many role-players. I’m not usually one to play the “it was so cheap, I couldn’t pass it up” card, but I gave away my TMNT books a couple years back — which I had bought as part of my “buy everything that someone, anyone ever may have recommended” phase, which thankfully ended quickly — and frankly, came to regret doing so. I’m a hoarder, I know, but they’re books, damnit. So for seven bucks, I bought Teenage Mutant Ninja Turtles & Other Strangeness. This copy even has a character sheet in the back, making it a sort of upgrade from the last copy I owned. Now, will I use this copy? If I take my own medicine, then yes, I should. The members of my role-playing group — currently stalled on Broken Spokes for scheduling reasons, surprise, surprise — are Palladium players from back in the day, so I think they would take to a Ninja Turtles game readily. In fact, I can imagine a proposed one-shot spinning out from there, but that wouldn’t stop the endemic scheduling issues. A lot of my role-playing library came from used book stores or online equivalents like eBay. There’s a Barnes & Noble over in South Burlington with a used books section that, for whatever reason, was a veritable spring of role-playing material. I picked up a lot of Mage: the Ascension and other White Wolf titles there for cheap. I discovered Changeling: the Dreaming because its brightly colored spine caught my eye from the bottom shelf. Maybe it has to do with being near the local university, pulling in students looking to dump a load of books for quick cash. Whatever the reason, that place was a gold mine, once this discerning shopper realized the trick was to comb through the over-sized shelf in the science fiction and fantasy section, where all the graphic novels, trade paperbacks and role-playing books were tossed together. Often there would be caches of books from a particular game line, as though someone chose to wash their hands completely of In Nomine or whatever. I don’t cruise the used book stores as I once did. Part of that is portion of the book-selling industry largely shifted online in the last ten years. The local shop with stacks of battered paperbacks have a hard time competing with online sellers for all the usual reasons: overhead costs, variety of inventory and so on. My buying habits changed, too. Two years or so into the role-playing hobby, I realized I was buying a lot of books, reading them once and then shelving them. I didn’t have a role-playing group at the time and was feeding my desire for hobby-related stimulus by amassing a frankly useless library of role-playing material. I mean “useless” in the sense I couldn’t possibly utilize all the material in a meaningful fashion, beyond superficially skimming plot seeds and character ideas for use in whatever game I happened to run, which I wasn’t even doing at the time. I’m a lot pickier these days. I still try to buy used when I can, though. A couple months after a book’s release, the odds are some unhappy role-player’s going to offload it on eBay, RPG.net’s trade and sales forum or some other similar venue. As long as I’m patient, and I typically am because I’ve played the “gotta have it now!” role enough to know it’s not worth the fleeting glow of getting something on the first day of release, then I can let other people find out what the game’s really like and then make a more informed decision. Of course, there are still the times when I impulsively buy Teenage Mutants Ninja Turtles & Other Strangeness because it’s on the shelf and I let the book hoarding tendency override my sensible consumer tendency. It’s an on-going struggle. I have my own funny hang-ups about being overtly nerdy in public. Patches on my bookbag? Fine. Wearing a convention badge when going out to eat? I waver about 50-50 between taking it off and leaving it on. But I get squirrelly when it comes to reading a role-playing game book anywhere less isolated than my favorite reading rock by Lake Champlain. Even when I do my adventure writing at Muddy Waters, it’s on a plain old laptop in an innocuous Open Office document. We’ll see if I can get the gumption up to break one out at Muddy Waters some weekday evening, say. I’m working my way through The Unexplained at the moment, and there’s still an unhealthily tall stack of other supplements demanding my attention. Fortunately, if I don’t find the nerve, I can try again in July and October. Yes, Read an RPG Book in Public Week is a tri-annual event, because the hobby needs the positive exposure, frankly. But please, like WJ Walton says, don’t “freak the normies” with Kill Puppies for Satan or World of Synnibar. Role-players have enough of a undeserved bad rap without giving people valid ammunition. If you’re not sure what to do with the dero and tero referenced in The Dyatlov Incident, check this post at The Gralien Report out. Micah Hanks covers a quartet of books about the forms of the underworld and its inhabitants through human history, as well as the particular expression that Richard Shaver brought to the public’s attention through the Amazing Stories magazine. Little or elusive people, extensive realms beneath the surface of Earth and problematic relations between the overworlders and underworlders are long-running tropes in role playing games. Just look at the Dungeons & Dragons‘ recurring setting element, the Underdark, one of the highest profile examples. The Shaver underworld, with its detrimental robots — or “dero” — and the fallen remains of a by-gone civilization that left Earth for a planet with a less harmful sun gives the whole thing a delightful pulp flavor. The Shaver Mystery has an ancient, lost world to explore beneath the ground, antagonists in the dero, who delight in kidnapping and tormenting surface dwellers and potential allies in the tero, the remnants of the original race below. It’s everything a role playing game needs. From Hanks’ write-up, it sounds like the key books for someone wanting to add them to their arsenal of material would be Caverns, Cauldrons and Concealed Creatures and This Tragic Earth are the best suited as idea vaults. The other two, Pulp Winds and The Pulsifer Saga, are examples of how other authors took Shaver’s ideas and ran with them in their own fictional works.